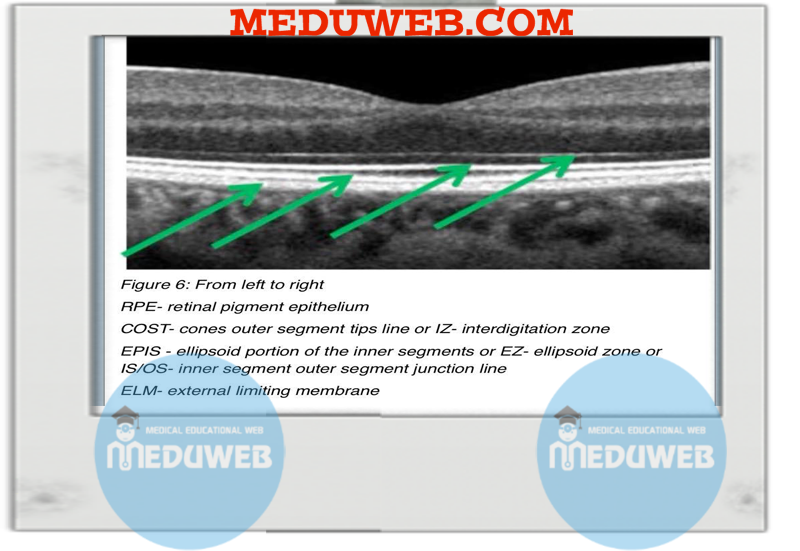 ✍️Posterior segment evaluation with OCT allows visualization of the vitreous, retinal layers, retinal pigment epithelium (RPE) and the choroidal layers. 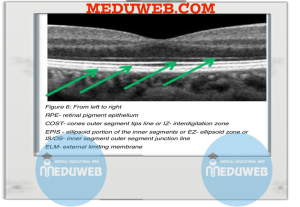 ✍️The posterior hyaloid of the vitreous can be identified on macula scans especially with spectral-domain (SD-OCT). ✍️useful in the evaluation of posterior vitreous detachments, vitreomacular traction or vitreopapillary traction. ✍️The instrument uses 840nm wavelength of light ( can’t penetrate denser vitreous opacities like Weiss rings or asteroid hyalosis). ✍️The inner retinal layers show atrophy secondary to retinal vascular occlusions like retinal artery occlusions. ✍️Four distinct hyperreflective lines are seen in the outer retinal layers of a SD-OCT scan on a healthy eye. ✍️Each distinct retinal layer is visible on the OCT and corresponds well to histological studies. ✍️Certain types of retinal conditions can affect different retinal layers. ✍️The retinal nerve fiber layer and retinal ganglion cell layer are affected in conditions like glaucoma. 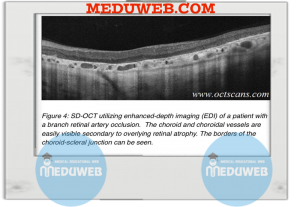 distinct hyperreflective lines are seen in the outer retinal layers of a SD-OCT scan on a healthy eye. ✍️These four hyper-reflective lines should always be identified when evaluating a macula scan. ✍️Certain conditions that affect the choroid have been found to have an abnormally thicker choroid. ✍️in CSR and PCV , the choroidal thickness is thicker with visible large dilated choroidal vessels compared to age-matched normals.